Are you ready to take your nursing degree to the next level? Regent's RN to B.S. in Nursing degree is perfect for licensed registered nurses wanting to build upon their nursing expertise. Develop the skills and criteria hospitals and healthcare organizations seek through online coursework taught from a Christian worldview. Enjoy job opportunities in specialty fields such as pediatrics, oncology, and more. Assess patient pathologies and collaborate on practice immersion management options. Apply modern techniques for health assessments and treatment methods. Manage health information systems and data management for safer patient well-being. Respected Leadership. A Competitive Edge. Dr. Kraft is a highly accomplished leader, instructor and practitioner with a distinguished history of building and expanding nursing programs. 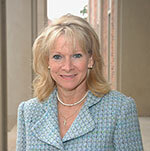 Prior to joining Regent, Kraft served as distinguished dean of nursing and health sciences as well as professor of nursing at the College of Coastal Georgia. Kraft’s leadership roles as associate provost and dean of the School of Nursing and Behavioral Health at Carson-Newman College solidified her reputation for creating rigorous programs led by strong faculty. At Waynesburg College, she served as an instructor. Kraft also served as a nurse practitioner for 40 years throughout the Southeast and Mid-Atlantic regions. Kraft earned both an MSN and Ed.D. from West Virginia University. She considers her special appointment as U.S. Secretary of the Army’s ROTC Education Subcommittee to be a career highlight. Second of two-semester series. Structure and function of the cardiovascular, immune, digestive, endocrine, and urinary systems. Three credit hours lecture with one credit hour lab. Prerequisite: Grade of C or better in BIOL 201. Basic principles of human nutrition are investigated, emphasizing the nutrients, food sources, and their use in the body for growth and health throughout life. Three credit hours lecture. The nature of microorganisms and their ability to interact with humans. Current techniques used to identify, culture, and control microorganisms. Three credit hours lecture with one credit hour lab. Prerequisites: Grade of C or better in BIOL 201 and 202. Principles and concepts of chemical thought and basic chemical laboratory procedures. Three credit hours lecture with one credit hour lab. Provides an introduction to the AACN’s BSN essentials, overview of scholarship and professional nursing with use of APA formatting, and application to professional collaboration and interdisciplinary communications. Prerequisite: Successful completion of ENGL 102 with a grade of C or higher. Basic knowledge of common physiologic pathologies in pediatric and adult patients and their clinical management. Prerequisites: BIOL 201, BIOL 202, BIOL 210, BIOL 215. Pharmacokinetics and pharmacodynamics of selected drug classes. Current issues in pharmacotherapy: identify vulnerable populations and the principles of pharmacotherapeutics across the lifespan including the effects of race, gender, and ethnicity. Prerequisite: CHEM 101. Develops skills in acquisition of clinical evidence to determine health risk, treatment modalities, and psychological and physical status. Three credit lecture hours and one clinical credit hour. Prerequisites: BIOL 201, BIOL 202, PSYC 102, PSYC 211. Develops leadership in complex transcultural systems while improving professional nursing practices and the application of novel administrative strategies to solve complex problems in large healthcare systems. Three credit lecture hours and one clinical credit hour. Prerequisite courses: tier one nursing courses. Develops skills in the use of evidence-based practice and the proper formation of appropriate forms for documentation and improvement of research. Prerequisites: ENGL 102, MATH 201 and tier one nursing courses. Develops global perspective on community-based health promotion and protection with emphasis on improving practices, equity, and affordability. Three credit lecture hours and one clinical credit hour. Computer technology in the healthcare field in order to improve patient outcomes; familiarity with the various technology media encountered in health care settings. Evaluate the legitimacy of information gathered from the Internet and assess electronic information as it relates to Evidence-Based Practice. Prerequisite courses: tier one nursing courses. Capstone course for the Nursing major. Includes development of an evidence-based research project that solves a clinical management problem. Prerequisite courses: tier one nursing courses. Submit your application using the Regent University Online Application. Pay the $50 application fee online during the application process. Fee Waiver: Attend an on-campus or online information session to learn how to streamline your application process, discover financial aid resources and waive your $50 application fee. We are able to examine and view your unofficial transcript from a U.S.-based school, which indicates successful completion of a bachelor's degree program, in order to review you for an admissions decision. Please submit your unofficial transcript to our Admissions Office by email to apply@regent.edu using the subject line: RN to BS Application Pieces. In lieu of the previously required writing sample, please complete a brief admissions questionnaire based on your professional goals and interests. This should only take a few minutes to complete but please answer the questions completely and thoughtfully. This gives us a better opportunity to get to know you and align your objects with our programs. The admissions questionnaire can be found here. Once completed, it will be sent directly to an enrollment counselor who will be in touch with you right away to help complete the rest of your application. In order to be admitted to the RN to BS in Nursing program, you must submit an active unencumbered/unrestricted nursing license from your state of practice. Deliver professional care that integrates faith, ethics and morality in the art of nursing practice through caring behaviors and service-minded approaches. Deliver professional nursing care that is theologically, philosophically and scientifically informed from the arts, humanities, biological and social sciences. Evaluate current research and translate findings to provide evidence-based nursing care. Utilize information technology in the decision-making process required in providing safe, quality patient-centered care in healthcare settings. Evaluate and apply legal aspects of healthcare policy, finance and regulatory environments locally, nationally and globally to ensure safe, quality patient-centered care. Interprofessional communication and collaboration in providing safe, quality patient-centered care. Apply principles of prevention and health promotion in providing care to individuals, families, groups and communities. Engage, professionally, with diverse and multicultural stakeholders in providing safe, quality nursing care. 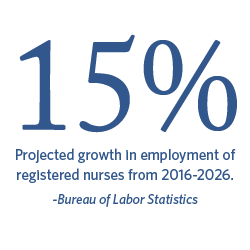 †Research by the American Association of the Colleges of Nursing (AACN).